"I wanted a big grackle on my arm. I had just survived my first year of doctoral studies in English at the University of North Texas, and my first year living in a state I found brutally hot and (sorry, Texans) pretty ugly. In north Texas, grackles are everywhere, and like pigeons in NYC (and I guess all major cities), the grackle doesn't get much love from humans. I chose this photo (which I found online) because it's beautiful, and it shows the splendor of the grackle when caught in certain light, at certain angles. I also like that the bird seems to be conspiratorial, confessing something to itself. I got the tattoo at Denton Tattoo Company. Josh Hurst rendered and tattooed the grackle beautifully. Josh now owns his own parlor, Victory Tattoos." parted or pulled back; the children dressed like the parents. He says, They, are they Jewish? I don’t know, I say. says, Can I help you? He means, Are you Jewish? of loaves, buns, bagels, twists. We have something that is not rye? Will you marry me, or Please, only a sip of your blackberry brandy. to crush under which foot they will not say. Justin Bigos is the author of the poetry chapbook Twenty Thousand Pigeons (iO Books, 2014). His poems have appeared in magazines such as New England Review, Ploughshares, The Gettysburg Review, The Collagist, and Crazyhorse. His fiction is forthcoming in McSweeney's issue 47. He co-edits the literary magazine Waxwing and teaches creative writing at Northern Arizona University. 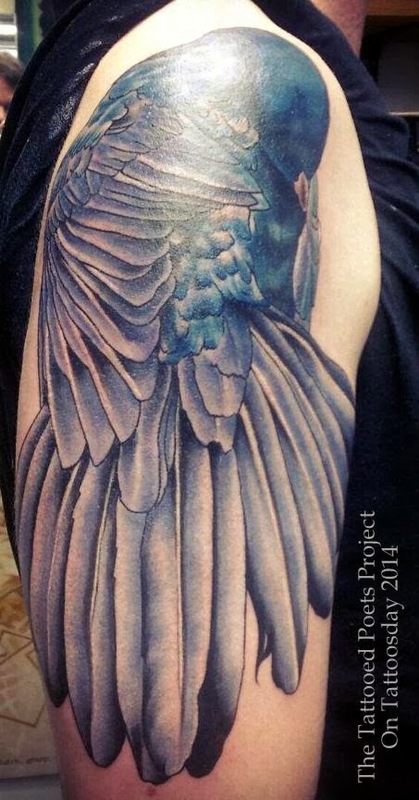 Thanks to Justin for sharing his grackle with us here on The Tattooed Poets Project on Tattoosday!